It has not yet been mentioned on this blog that the Münchener Kommentar zum Bürgerlichen Gesetzbuch, Vols. 11 and 12, is now available in its seventh edition (2018). 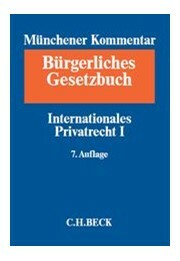 This work is a standard treatise not only on German private international law, but on European PIL as well. The new edition contains detailed commentaries on the Rome I, II and III Regulations (by Abbo Junker, Munich; Dieter Martiny, Hamburg/Frankfurt [Oder], Ulrich Spellenberg, Bayreuth, Peter Winkler von Mohrenfels, Rostock), the Hague Protocol on Maintenance (Ansgar Staudinger, Bielefeld) and the European Succession Regulation (Anatol Dutta, Munich). It also contains an introduction to the new EU Regulations on Matrimonial Property and Registered Partnerships (by Dirk Looschelders, Düsseldorf). The relevant Hague Conventions on the Protection of Children and Adults are commented on as well (by Bettina Heiderhoff, Münster, Ansgar Staudinger, Bielefeld and Volker Lipp, Göttingen). The seventh edition is the second one prepared by Jan von Hein (Freiburg/Germany) as volume editor, who has updated the commentary on the general principles of European and German PIL. „A battle cruiser of private international law has been set on a new course“ (IPRax 2015, 387). „…a truly indispensable work“ (Ludwig Bergschneider, FamRZ 2015, 1364). Further information is available on the publisher’s website here.